In this post, we will talk about key experimentation concepts including how to choose your Overall Evaluation Criteria (OEC) for your experiments and how to increase the sensitivity of those metrics through metric filtering and metric capping. What Makes a Valuable OEC? 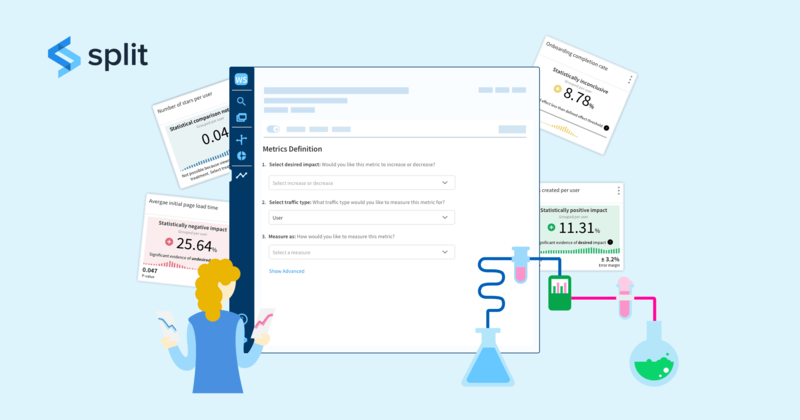 The experiment metrics you chose should change due to small changes in user satisfaction or business value so that the result of an experiment is clear within a reasonable time period. For example, if a user only buys something from your website once a year, this will not be a useful metric for an experiment as it will be difficult to influence. You may be creating a more positive user experience, but it won’t be noticeable if you are using only this one metric. If overall the business value increases, the metric should move consistently in one direction. If it decreases, the metric should move in the opposite direction. Some metrics can have ambiguous directions. For example, you may be measuring engagement with your customer support. Perhaps an increase in this metric might be a good thing as it could indicate more engagement with your core product. However, a decrease in this metric could indicate your core product has become easier to use and less support required. To follow on from the point above, ensure the metric you are measuring is understandable, both in its direction and definition. Ensure that your chosen OEC ties and experiment directly to business value. It should be easily understood by your entire organization, from your summer interns all the way to your management team. What Additional Metric Types do I Need to Consider? These metrics are specific to an individual experiment and could be things such as click-through rate, scroll rate, and certain inputs. They are metrics that are important to a particular team. These metrics are the metrics that should not degrade in pursuit of the OEC, and the team should take action if they do so. Similar to the OEC, they should be directional and sensitive and still tie to business value but indirectly. For example, page load times, app crashes, unsubscribe rates. Available for on Split’s Platform Edition as part of the Experiment package. 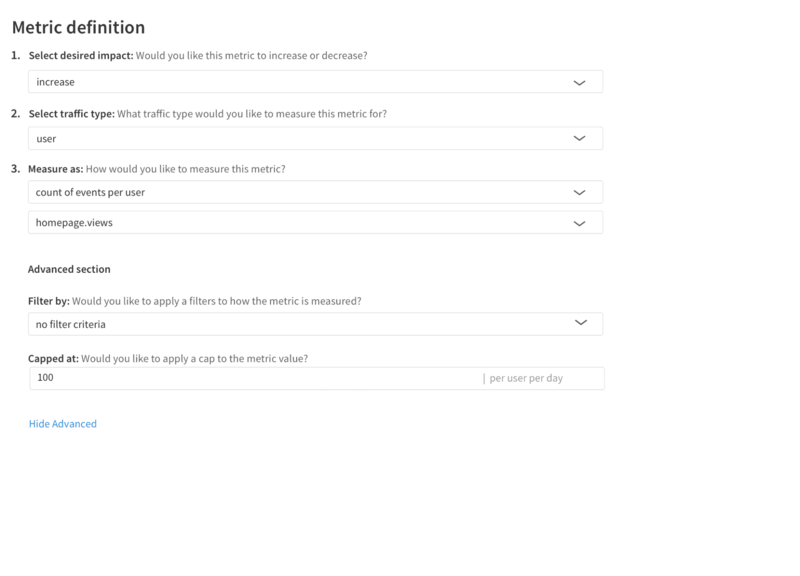 It is now even easier to create metrics in Split that are tailored to the needs of your organization. You can define the function to perform or calculate specific analyses on events. Split supports five different functions to provide the foundation of your metrics; sum, count, average, ratio, and percent. These functions can be performed across your traffic type or per your traffic type. Across metrics represent a total value and will not be marked statistically significant. We recommend using “across” to measure the total change and to use “per” to measure the total change per your traffic type. What is Metric Filtering and Why is it Useful? Applying a filter to your metric can help you improve the sensitivity of your metric by refining the sample used in the analysis. Filtering is most often used to provide deeper analysis of how customers progress through a particular flow in your product. An e-commerce company may seek to drive an increase in purchases, and it is important to track that purchase rate globally, but it is often valuable to see where in the process customers are dropping off. By filtering, you can see the behavior of customers who reach particular points in the funnel, such as purchases of those who visited a product page, or those who added something to their cart. Filtering is also used to create metrics that target only users who engage in a particular behavior, for instance observing the support ticket rate of those users who experience an exception or of users who completed the onboarding process. What is Metric Capping and Why is it Useful? Applying a cap to your metric definition can have a dramatic impact on your experiment results. 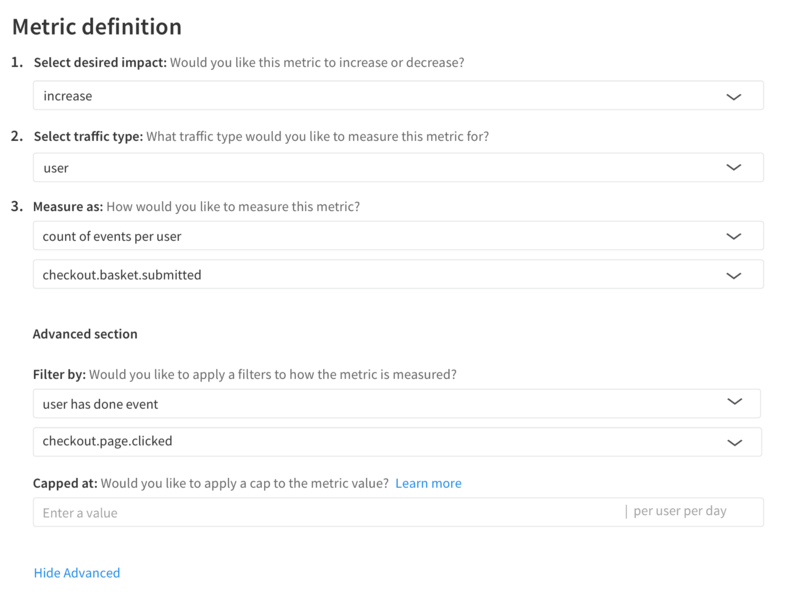 With metric capping, any outlier values in your metrics will be capped and replaced with a fixed threshold value. By applying this cap, you can reduce the variance in your metrics, reducing the impact of outliers, and drive toward significance faster. For example, perhaps you have an experiment with a goal to drive an increase in checkout value on your website. Looking at your historical data, you know in the last 6 months your checkout value has been an average of $60 per user per day. Therefore, if you were to apply a metric cap, based on the context of your organization, any checkout value above $300 could be considered an outlier. In this example, the metric cap would be set at $300 per user per day. In addition, metric capping can also remove the risk of bot activity included in your experiment analysis. This is particularly useful for metrics such as views per user. For example, say based on historical data of your website the average number of homepage views is 40 views per user per day. Therefore if you were observing 1000s of views per user per day, you could confidently categorize this as bot activity. When you are starting off in experimentation give yourself the flexibility to iterate on what you choose to measure. As you hone in on what makes sense for your organization you will discover what truly reflects business value. We hope this post gives you some useful frameworks to help you define the metrics for the experiments ran by your organization.